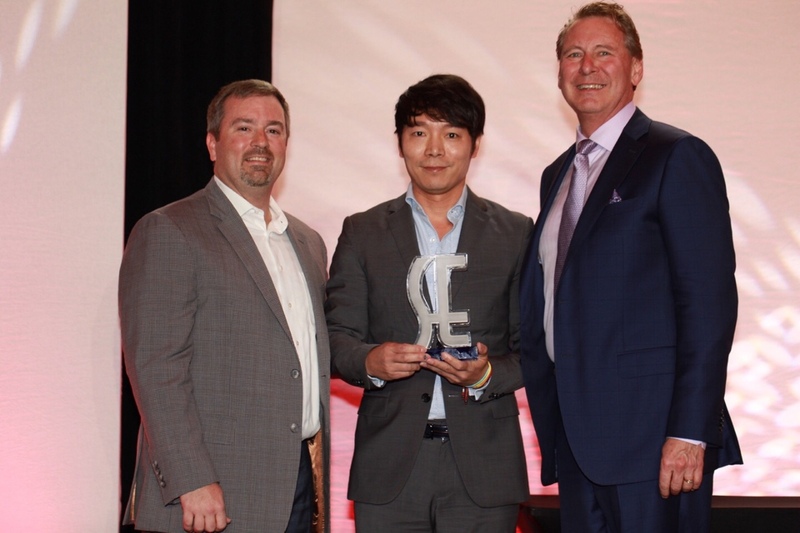 Miami, Florida (October 26, 2018) – CJ 4DPLEX (www.cj4dx.com), the world’s leading cinema technology company, announced today that the Film Expo Group has selected the company for the ShowEast “Innovator of the Year.” The organization will present the award and honor Brandon Choi, CEO of CJ 4DPLEX America, as a part of the ShowEast Awards Ceremony on Thursday, October 25 at the Loews Miami Beach Hotel. ScreenX is the world’s first multi-projection theater technology, created in 2012, to enhance the movie environment by allowing moviegoers to go beyond the frame of the traditional movie screen. It expands the center image of feature films to the left and right walls of the theatre, creating an immersive, panoramic, 270-degree experience. ScreenX has quickly enhanced its international reach, screening local feature films and Hollywood blockbusters alike. Following the success of past releases which include “Black Panther,” “Rampage,” “Ant-Man and The Wasp,” “The Meg,” and “The Nun,” ScreenX will release eight titles this year, doubling the number of releases from 2017. For 2019, ScreenX is on track to release one film per month, potentially releasing up to 15 films. From the multi-picture agreement with Warner Bros. Pictures, announced earlier this year at CinemaCon 2018, confirmed titles for the remaining 2018 line-up will be “Aquaman” in December and for 2019, “Shazam!” in April. Remaining titles for 2018 are to be announced in the coming month. To date, there are 167 ScreenX auditoriums in the world, with 9 auditoriums in the U.S.
ScreenX is the world’s first multi-projection system used within a theatre setting. It was created in 2012 by CJ CGV, part of South Korean conglomerate CJ Group, as one of the “next cinema formats” along with 4DX, the multisensory cinema technology with motion and environmental effects. ScreenX allows moviegoers to go beyond the frame of the movie screen by expanding the center image of feature films and pre-show advertising to create an immersive, panoramic, 270-degree format that projects onto three theatre walls. To date, ScreenX has been installed in 167 screens around the world, including 84 screens in South Korea; 51 screens in China; 9 in the United States; 5 in England; 4 in Turkey; 3 in Switzerland; 2 in France; 2 in Vietnam, and 1 in Spain, Hungary, UAE, Kuwait, Thailand, Japan, and Indonesia. CJ 4DPLEX is the world’s first 4D cinema company, headquartered in Seoul with international offices in Los Angeles and Beijing. The company created 4DX, the first and leading 4D cinema technology for feature films, providing moviegoers with an immersive cinematic experience that utilizes all five senses, allowing the audience to connect with movies through motion, vibration, water, wind, snow, lightning, scents, and other special effects that enhance the visuals on-screen. CJ 4DPLEX brings 4DX auditoriums to exhibition partners along with 4DX codes for both major Hollywood blockbusters and local titles. Each auditorium incorporates motion-based seating synchronized with more than 20 different effects and optimized by a team of skilled editors, maximizing the feeling of immersion within the movie, beyond the limits of audio and video. Since 2009, more than 570 Hollywood and local titles have been screened in 4DX. To date, more than 67,000 4DX seats operate in 570 auditoriums spanning 59 countries.